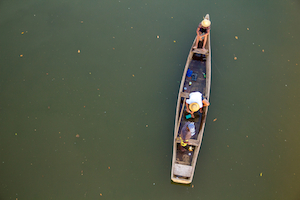 In the Amazon, artisanal fishing is of paramount importance to the livelihood and income of traditional communities. As it plays a central role in the culture of the region, it is especially important to maintain its contributions for the conservation of coastal and marine ecosystems. At present, there are several bottlenecks in the production, processing and commercialization of products that affect the structure of and hinder the development of artisanal fisheries value chains. In 2017, CSF-Brazil completed the mapping of the value chains of fisheries held by traditional communities in the Brazilian Amazon including shrimp fisheries in the Brazilian states of Amapá, Pará and Maranhão and crab fisheries in the state of Pará. Value chain mapping assesses the current state of production and determines alternative approaches that may be more efficient during production, processing and distribution. The aim is to understand the various actors (fishermen, middlemen, traders, consumers, service providers, aid agencies and regulators, etc.) and their respective roles; activities, costs and benefits involved; the production flow; various prices from the fishermen to the final consumer, etc. To gather additional information, we administered questionnaires to local actors. Participatory workshops were also organized to share preliminary results and obtain feedback. We then identified the main challenges and opportunities for strengthening the fisheries’ value chains. The results and our recommendations will help communities and various stakeholders within the fishing sector and civil society, UNESCO and other partners to develop policies and actions seeking to strengthen fishing as a sustainable source of income. Please, click here to download our full study; here to know about our field trip for data collection; and here for more information about the presentation of our results. This study Mapping of the Value Chains of Artisanal Fisheries of the Brazilian Amazon Coast: current state and strengthening perspectives was conducted as part of the Sustainable Fisheries of the Brazilian Amazon Coast Project (PeSCA), - a partnership between the Vale Fund and UNESCO, in cooperation with the CSF-Brazil and the Mitsui Bossan Foundation of Brazil.